Do you think you know everything there is to know about Augusta National and the Masters Tournament, from Gene Sarazen's “Shot Heard Round the World” in 1935 to Louis Oosthuizen's albatross in 2012? You might even know who was the last persimmon winner (Bernhard Langer) and when Arnold Palmer made his last Masters cut (1983). But no matter how much you think you know about the Masters, get ready to have your mind blown by GOLF travel editor and resident golf history expert Travelin' Joe Passov with these 18 facts about the world's most famous golf course and tournament. 1. On Oct. 23, 1983, President Ronald Reagan was playing at Augusta National as a guest of his secretary of state (and club member) George Schultz when his round was interrupted at the 16th hole by a disgruntled local named Charles Harris, who had crashed his truck through the gate and was demanding to see the President. Harris held hostages at gunpoint in the pro shop for two hours before Secret Service agents subdued him. 2. Course architect Alister MacKenzie's penchant for visual misdirection was inspired by his observations of the innovative use of camouflaged trenches by the Boers while he served as a doctor in the British Army in South Africa until 1902. 3. The previous year's Masters winner gets to pick the menu for the famous Champions Dinner on Tuesday night, but that doesn't mean the former champions have to eat it. Attendees are free to order off the clubhouse menu, and many do. When Sandy Lyle served haggis, Scotland's national dish, in 1989, Jack Nicklaus quipped, "Oh, I hope he enjoys it." 4. There's a natural spring between the 13th and 14th fairways that spouts gold dust when it rains. 5. An original membership share in Augusta National cost $350, which in today's dollars would be in the neighborhood of a paltry $4,217. 6. In 1956, President Dwight Eisenhower had to choose between a scheduled trip to Augusta or throwing out the first pitch at the Washington Senators' home opener. When the team realized that Ike was going to choose Augusta over the national pastime, the Senators changed their schedule. 7. Augusta National's co-founder Clifford Roberts [below at the 1972 Masters], a taciturn financier turned autocrat, was at turns beloved and despised. In the fall of 1977, at age 83 and in failing health, Roberts walked to a slope next to Ike's Pond and ended his own life with a single pistol shot to the temple. 9. Amen Corner generally describes the 11th, 12th and 13th holes, though more precisely, it's the second half of the 11th, all of the 12th and the first half of 13. Sports Illustrated's Herbert Warren Wind coined the phrase in the April 21, 1958, issue, basing it on a mid-1930s jazz recording he remembered called “Shouting at Amen Corner” by Mezz Mezzrow. Wind found a perfect moniker to describe where so much pivotal action took place, even if the actual recording, “Shoutin' in that Amen Corner,” was made by the Dorsey Brothers Orchestra, with Mildred Bailey on vocals. 10. The Eisenhower Tree may be gone from the 17th hole, but the Eisenhower Cabin remains. One of 10 residential cottages (called “cabins”) built to the left of the 10th fairway and next to the Par-3 course, Ike's Cabin was built in 1953, while he was the sitting president. Time Magazine reported at the time that it cost $75,000. Butler Cabin is the most famous, where winners are interviewed and presented with green jackets. The exterior never makes the telecast, except in 2011, when Rory McIlroy's 3-wood from the 10th tee nearly hit it. 11. 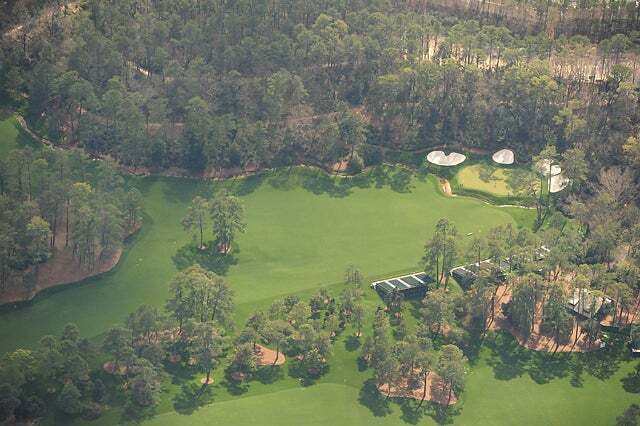 Aside from Alister MacKenzie, 10 other practicing architects have tinkered with Augusta National. Most underrated was Perry Maxwell, who converted the ho-hum par-4 7th into a terror, with its shallow, elevated green fronted by deep bunkers [photo below]. He also relocated the 10th green some 50 yards up a hill and to the right. The most prominent change was made by Robert Trent Jones Sr., who in 1947 transformed the par-3 16th from an easy 145-yard pitch over a creek into a 170-yard shot over a pond, with a brand new tee and a new green well to the right of the original. 12. The massive live oaks behind the clubhouse aren't indigenous to the region, but were likely imported from the Georgia coast in the mid-1850s. Augusta National was once a commercial nursery, so it's no surprise to see plants, trees and shrubs of all kinds, notably the dogwoods, magnolias and azaleas. Most unusual is the tangled wisteria vine that clings to the clubhouse, thought to be among the first ever in the U.S., and a hard-to-spot palm tree short and right of the green at the par-3 4th, a hole that was called “Palm” in its early days. 13. Augusta National's nines were switched after the inaugural Masters in 1934. Yet, records show Alister MacKenzie had first conceived of the current configuration, then changed the plan prior to construction in 1931, possibly to have the 18th (the present 9th) finish near the “new” clubhouse. The nines were reversed, to their present order, because the lowest parts of the course (today's 10th through 12th holes) were susceptible to frost and drainage issues. Switching the nines allowed play to start earlier -- and yes, for more drama near round's end. 14. The original late 1920s prospectus for Augusta National called for the handsome 1854 manor clubhouse to be razed. The new edifice was to have been outfitted in whitewashed brick and would have housed a gigantic locker room. In 1931, and early member named Harry Atkinson wrote to club co-founder Clifford Roberts, stating that Atkinson's wife was quite fond of the building and asked that it be renovated instead. With money tight at the time, the clubhouse survived -- and prospered. 15. From 1943 to December 1944, Augusta National closed as a golf club. At Jones' suggestion, it chose to support the war effort and improve its own finances by housing 200 head of cattle and more than 1,000 turkeys. The livestock kept the grass “mowed,” but they also beat up the fairways and devoured the plantings. Forty-two German POWs held at nearby Fort Gordon were brought over to restore the course. Members of a bridge-building engineering crew in Rommel's Africka Corps, the POWs erected a bridge over Rae's Creek near the 13th tee that lasted until the 1950s. 16. Tributaries of Rae's Creek provide beauty, drama and menace throughout Amen Corner, most notably as the slender but lethal hazard fronting the par-3 12th. The creek is named for John Rae, who was prominent in Augusta circles beginning in the 1740s. Rae was a principal in Brown, Rae and Co., a leading trade partner with Indians in the southeast, primarily in deerskins, a prized commodity that the Colony of Georgia shipped back to England. 17. For years, it was mistakenly written that Bobby Jones chose Dr. Alister MacKenzie to design his dream course on the strength of Jones' positive visits to MacKenzie's Cypress Point and Pasatiempo in 1929. 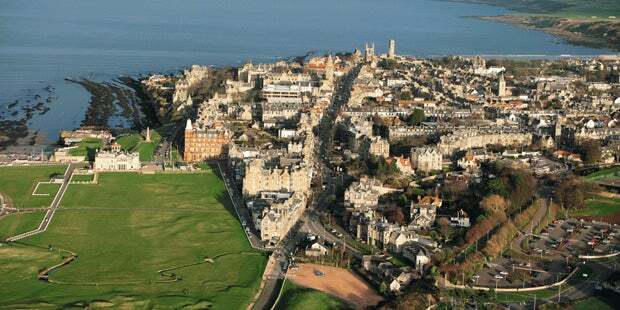 Actually, the two men had met earlier at St. Andrews, and it was their shared love of the Old Course that bonded the two. MacKenzie's last visit to Augusta occurred in the summer of 1932, so he never got to see his completed work. He died on January 6, 1934, less than three months before the first Masters. 18. In May, on the very last day the club is open before closing for the summer, Augusta National's caddies play free all day.